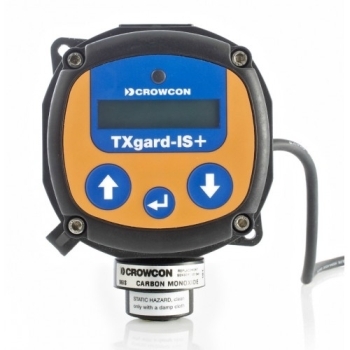 Reliable detection of flammable, toxic or oxygen gases with a local display and optional relays, is what the Crowcon Flamgard Plus and TXgard Plus range of detectors have been built for. Flamgard Plus - Exd - Flameproof flammable gas detector with local display and optional relays. TXgard Plus - Exd - Flameproof toxic or oxygen gas detector with local display and optional relays. TXgard-IS+ - I.S. - Intrinsically Safe toxic or oxygen gas detector with local display. C01338	Spray deflector. For outdoor installations & protection from water sprays. C01339	Flow adaptor, for use in sampling applications. 00027D	Stainless steel duct mounting plate - for GRP junction boxes. Maximum duct airflow: 6 metres per second. Use TXgard-IS+ detector with side-entry. M02025	Cable gland M20 Nylon. FLP/A/A	0-100% LEL with a VQ21T pellistor - gas types available methane, pentane, propane, butane, hexane, hydrogen, LPG, methanol, ethanol, propanol, ethylene, ethane, toluene, petrol vapour (unleaded) and carbon disulphide. FLP/H/A	0-100% LEL with VQ1 pellistor - gas types available methane and acetylene†. FLP/A/R	0-100% LEL with VQ21T pellistor - gas types available methane, pentane, propane, butane, hexane, hydrogen, LPG, methanol, ethanol, propanol, ethylene, ethane, toluene, petrol vapour (unleaded) and carbon disulphide. FLP/H/R	0-100% LEL with VQ1 pellistor - gas types available methane and acetylene†. C01052	Spray deflector. For outdoor installations & protection from water sprays. C01051	Collector cone. For aiding detection of light gases such as methane. C01254	Carbon cloth filter (self adhesive). Removes long-chain hydrocarbons. ATEX Certified Exd Cable Gland Adaptors. M02354	Exd/Exe certified brass cable gland. M20 x 1.5mm thread, suitable for Steel Wire Armoured cables with outside diameter 15.5mm to 21.1mm (inner sheath 6.7mm to 14mm). Certified ATEX II 2 GD, Exd IIC/Exe II. Certified to ATEX, IECEx, CSA, GOST-R and NEPSI standards. IP66/67/68.